In the eighteenth dynasty of ancient Egypt (1351 to 1331 B.C.) one woman, Nefertiti, rises to power and infamy in the annals of history. The story of Nefertiti’s life unfolds through the voice of her younger sister, Mutnodjmet. 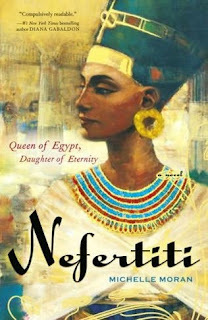 Nefertiti is beautiful, ruthless and narcissistic who seeks affluence and supremacy. Mutnodjmet, the younger sister, is pretty, level-headed, and pragmatic and she has no desire other than to live a simple life surrounded by a loving family. At an early age, Nefertiti marries Prince Akhenaten who becomes heir to the throne after the mysterious death of his more capable older brother. Mutnodjmet is assigned to be Nefertiti’s companion, eyes and ears, and voice of reason. Akhenaten is a youth bent on forcing his own religious views onto the people. It is his mother’s hope that Nefertiti be the sound of reason and restrain his impulsive, reckless actions and thoughts. Instead, his ego, and that of his new wife, Nefertiti, knows no bounds as together, they raise their status, create a new god named Aten for all to worship, and build an entire city to glorify. Nefertiti’s obsessive dependence on Mutnodjmet is so extreme, that it threatens her own future happiness. While Nefertiti becomes more and more involved in building her and her husband’s fame, Mutnodjmet seeks to escape her sister’s clutches. Conspiracy and treachery abound throughout this novel. Michelle Moran brings to life multi-dimensional characters through rich dialogue and intricate historical detail. Highly credible, the story captivated from start to finish. The level of research into this period and Nefertiti’s life is impressive. For all aficionados of ancient Egypt, this is a must have book that will not disappoint. It has my highest rating and I will be eagerly anticipating future books by Michelle Moran. You are very welcome, Michelle. It mesmerized me and I can't wait for your next novel. Congratulations on your success.